This was a quick piece done for an exhibit at Works/San José show, Unity In Diversity. This theme relates to a graphic design project by San Jose State BFA student Javier Yep in 2017 that included a “unity in diversity” flag. This particular call asked for self-portraits and biographical work. While I’ve used myself in a model in some works, that’s not usually my first choice. I don’t find self-portraits an especially effective path for introspection for me; I am comfortable enough in my own head and processing the visual layer is extra noise. I’m white, and see enough people that look like me in art. And I’m a white woman, and white women in particular are overrepresented as art subjects. Yet they are also underrepresented as artists themselves – so I’ll do self-portraits mostly for the sake of participation in shows when that’s the focus. 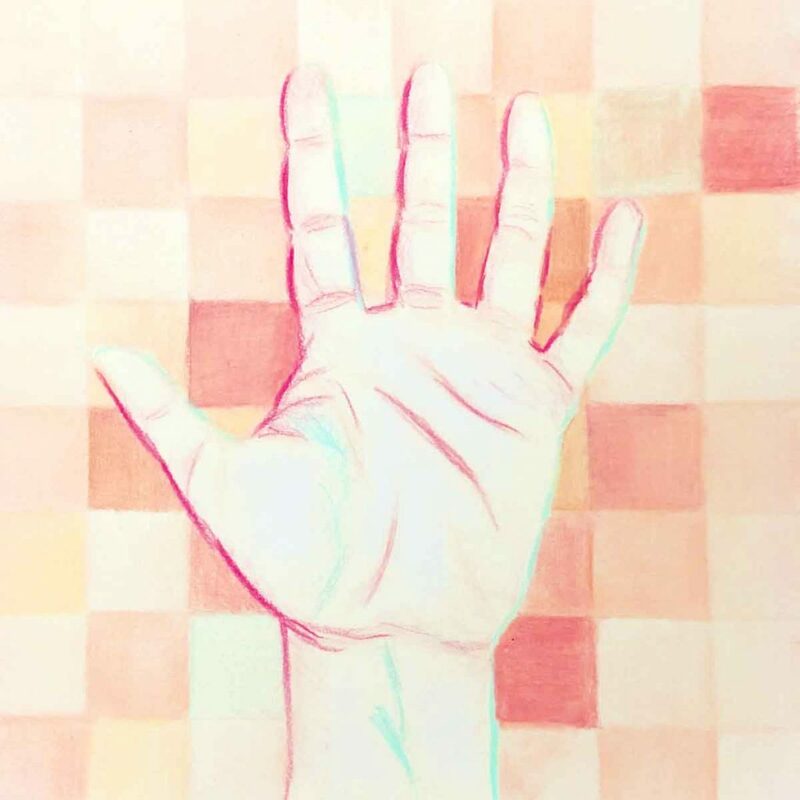 I thought about a show of portraits and figured a little variety would help (doesn’t need to be a sea of heads), so I used a part of me I see all the time: my hand. I’ve painted a lot of hands this last year so it feels very familiar now. I picked my non-dominant hand for ease of sketching. I used a limited, saturated palette to emphasize the colloquial description of “white”, and also to emphasize my alarmingly aqua veins. That also led to some spiffy two-gel-light looking edge detail that gives it a nice ’80’s vibe too. The squares behind it are a pixelly/patchwork representation of the range of tones of my “whiteness”, which on reflection, became a study of body weirdness. I think of pink because I burn easily and have a little rosacea. I think of brown because I get a touch of melasma from sun now. I think of a light blueish on my palm at the base of my thumb. I think of a disturbingly cream color when my toes go numb when it’s cold. It ends up being a survey of details to contrast with the reductiveness of the style of the hand. That, or it simply looks pleasant; really, it’s both.